The economy has done “okay” the last few years largely because business leaders were confident in the future. We’ll know the end is coming when they lose that confidence. This is valuable data because small businesses drive job creation. And they are usually well informed about local conditions. NFIB surveys its own members, who are indeed business owners. But they also voluntarily joined an organization that advocates lower taxes, deregulation, and smaller government. So of course Donald Trump’s election win made them happy. He had promised many things they wanted. More significant is that they stayed happy and optimistic, and grew even more so. 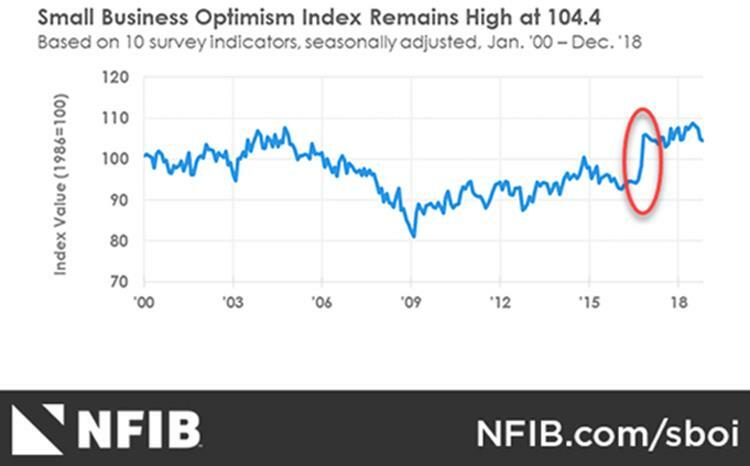 The NFIB index hit an all-time high in August 2018. Then it fell in each of the next four months. Those declines are small and still leave the index higher than it was before the 2016 election. But it’s starting to look like a downtrend. Given the lack of other positive news, it’s hard to imagine what would make the NFIB index turn higher from here. As noted, sentiment data is imprecise. None of this means an imminent breakdown. But it is concerning, especially when larger studies show similar attitudes. The Federal Reserve’s “Beige Book” is a collection of anecdotes, assembled eight times a year by regional Fed staff who talk to their business contacts. It’s not infallible, but it’s good for general impressions. They saw something new, a notable change just in the last few weeks. Maybe weak oil prices are hurting Texas more than we think. Notably, consumers showed lower confidence for both present conditions and future expectations. People know something is wrong. Their behavior and economic decisions will increasingly reflect it. None of this is reason to panic. It does, however, support what other data has been telling us. US economic growth is slowing. That’s due to both cyclical factors and the Fed’s rate hikes and quantitative tightening.